The seven documents included the one on land border crossing. During the visit, Swaraj met with Myanmar President Win Myint and State Counsellor, Minister for Foreign Affairs Aung San Suu Kyi. The two sides discussed boundary and border related issues, peace and security matters, as well as development in Rakhine state, including the return of displaced Rohingya people, India’s development assistance to Myanmar, ongoing projects and other issues of mutual interests. The Indian Minister also met with Commander-in-Chief of Myanmar Defence Forces Senior General Min Aung Hlaing. 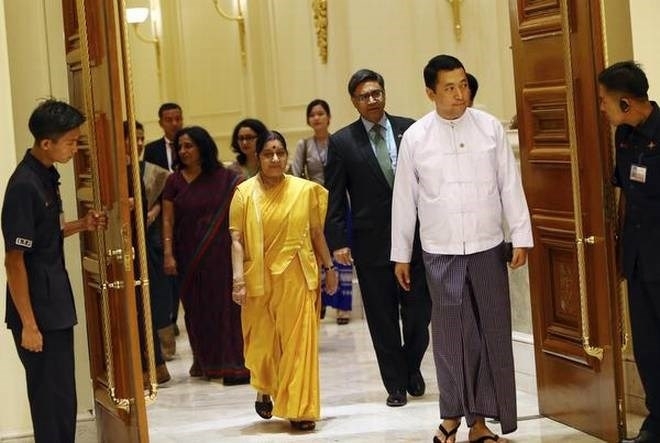 Swaraj also reiterated India’s readiness and commitment to helping the Myanmar government in addressing issues related to Rakhine state. India was already in the implementation stages of various projects that would respond to the needs of different sections of the Rakhine state population, she added. The Minister also underlined the need for safe, speedy and sustainable return of displaced people to Rakhine state.